Fourth Row Center: Film Writings by Jason Bailey: #SXSW Review: "Bernie"
A couple dozen locals appear in the film, which uses their documentary-style talking heads to introduce the characters and the location (which is like another character). 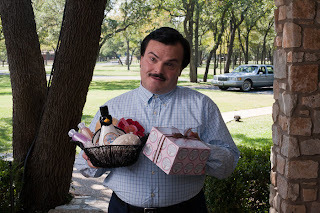 Linklater mashes up those interviews with his recreated scenes, telling the story of Bernie Tiede (Jack Black), the probably-gay assistant funeral home director who became the companion of a rich, mean widow (Shirley MacLaine), but was driven by her cruelty to put four bullets into her. He then proceeded to cover up her death for nearly a year, while continuing to spend her money. When he was finally found out, the local district attorney, Danny Buck Davidson (Matthew McConaughey), had to petition for a change of trail venue—because he was worried no one in Carthage would convict good ol’ Bernie. It’s no exaggeration to say that the picture hinges on Black’s beautifully modulated comic performance. It’s not a subtle piece of work, but it’s believable; I’ve known men like this, and I’ll bet you have too. He approaches caricature in his voice, his gait, his rolly-polly mustache, but he doesn’t cross the line—Bernie is a high-energy character, sweet and infectiously good-natured, and there’s something about the gusto with which he sings along to the gospel tune on his car radio early on that tells us most of what we need to know about the character. (For those interested in such things, the actor does more singing in this film than he has in any since Tenacious D: The Pick of Destiny.) Later on, in a key interrogation scene, Black invests in Bernie’s humanity and still gets the big laugh provided by the script, which is no easy trick. MacLaine is a welcome presence, though she’s not given many notes to play here. The role is primarily one of grouchy antagonism, a slightly more mean-spirited version of her Ouisa in Steel Magnolias, but she does have one transcendent moment outside of that mold: when, for the first (and perhaps only) time, a big, happy smile spreads slowly across her face. McConaughey’s performance is appropriately outsized; in an ill-fitting suit and big, terrible glasses, his skin the color of a honey-smoked ham, his is an ingeniously silly turn. Linklater’s always had a wry comic sensibility, and his direction here is like a motor, equally smooth on a purr or a rev. The interview scenes allow him to indulge a pure enjoyment of the regional patter (“her nose was held so high, she’d drown in a rainstorm”), and there are amusing little splashes of color here and there—I wouldn’t dream of revealing the circumstances for the line “Straight to Dallas, and no stoppin’ for coffee,” but it gets one of the heartiest laughs in the picture. The filmmaker is negotiating a tricky line between comedy and drama (the crime itself is played straight—mostly), and he gets the mixture right, most of the time. Alas, Bernie runs out of gas a bit in the third act, as it begins to rely too heavily on those talking heads, and gets bogged down in the conventions of its courtroom scenes and resolution. But if it overstays its welcome a bit, that’s forgivable; it’s still an entertainingly playful documentary/narrative hybrid, and finds a couple of our scrappier actors doing some vivid and interesting work. "Bernie" premiered Wednesday night at the South by Southwest Film Festival. It opens April 27 in limited release.